With much hard work and through generous community support, Ballet Chelsea has grown into a multifaceted arts organization that provides high caliber dance training, arts education and performance opportunities to students from many mid-Michigan communities. Ballet Chelsea brings cultural enrichment to many through performances, lecture demonstrations and our Adaptive Dance Program. 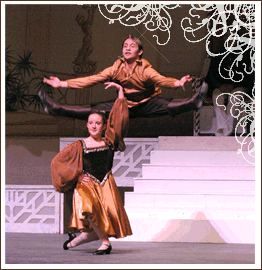 Ballet Chelsea believes in excellence and has been recognized for achievement. Ballet Chelsea received the 2017 Small Business Leadership Award from Chelsea Chamber of Commerce. In 2016, Artistic Director Wendi DuBois was honored as a Touchstone Educator of the Year by Michigan Youth Arts Festival. The success of Ballet Chelsea’s Alumni demonstrates the impact of arts excellence as many graduates are performing with professional dance companies, working as leaders in arts management, or educating new generations of artists in colleges and dance schools around the country. These new leaders will continue the tradition of excellence in the arts that they received at Ballet Chelsea building a much broader community of arts supporters. In 2014, Ballet Chelsea opened a new school, offering a broader scope of training in a beautiful state of the art dance facility featuring several well lit, spacious studios. Ballet Chelsea’s staff includes professionals with varied and extensive backgrounds in broad spectrum of dance mediums and performing arts. Our curriculum provides dance opportunities for all ages through pre-school classes, recreational programming, adult classes, academy curriculum and professional training. With extensive offerings in many dance disciplines, Ballet Chelsea can reach more individuals who wish to experience the joy of movement and dance. Ballet Chelsea’s newest addition, the Adaptive Dance Program, brings the gift of movement and music to many people who do not have access to dance classes. ADP instructors work with people from the ages 3 – 93 with a wide range of abilities, tailoring each class to the needs and abilities of the participants. The curriculum aids in improving coordination and balance, stamina, flexibility, self-confidence and teamwork. Classes are held throughout mid-Michigan at special education classrooms, residential centers and senior communities as well as at the studios of Ballet Chelsea. This program was first developed in 2015 with financial support from the 5 Healthy Towns Foundation. Numerous supporters include 5 Healthy Towns Foundation, Ann Arbor Area Community Foundation, Chelsea Community Foundation, The Wilkinson Foundation, Community Foundation for Southeast Michigan and private donors. Ballet Chelsea offers cultural experiences to many communities through the gift of performance. Jazz Ensemble and Dance Beat! performances highlight contemporary movement at numerous community events including Chelsea Sounds and Sights, lecture demonstrations at pre-schools, retirement centers as well as an annual performance open to the public. Ballet Chelsea’s Performance Company collaborates annually with the Jackson Symphony Orchestra presenting the beloved holiday performance of the Nutcracker and other collaborative ventures. The Performance Company also presents an annual spring ballet, repertory concert while participating in numerous smaller performances including Youth America Grand Prix, Michigan Youth Arts Festival, and community performances. Ballet Chelsea began as a 501 (c) (3) non-profit performing organization housed in a for profit dance studio, Dance Arts of Chelsea. Formed in 1995 to provide supplemental dance training for Chelsea dance students, the tiny organization initially offered a few local performances each year.